Combat actions continue in all sectors with lower intensity. Combined Russian-militant forces fired Grad in the Mariupol sector. 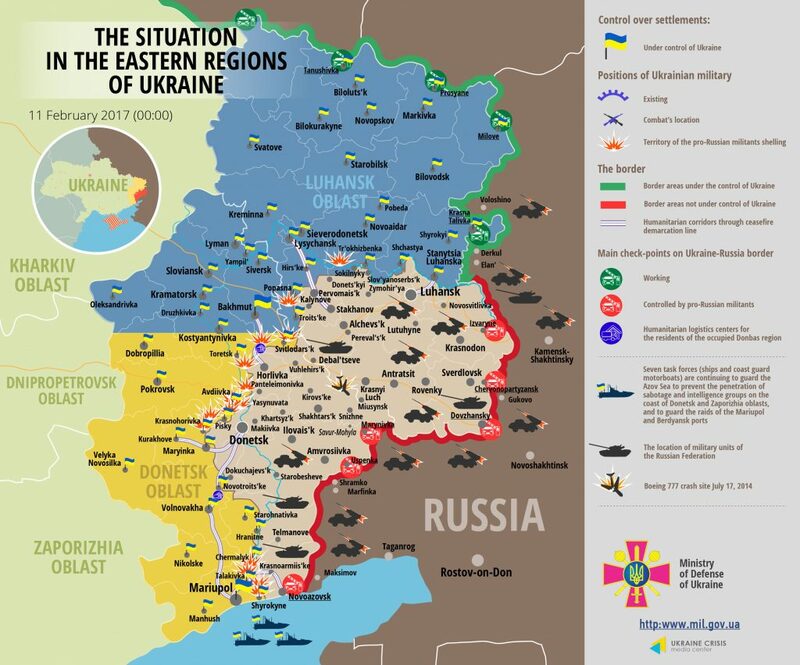 Ukrainian troops incurred no casualties in the combat zone over the last day. No troops were either killed or wounded in action. In the Donetsk sector Avdiivka and its outskirts stand as epicenter of combat actions, reported Colonel Oleksandr Motuzyanyk, spokesperson of Ukraine’s Defense Ministry on ATO-related issues at a press-briefing at Ukraine Crisis Media Center. “In Avdiivka hostile attacks started at 8am and lasted all day with breaks. Overwhelming majority of the attacks was made with the use of light weapons. Occupying forces fired twice from mortars targeting the industrial area (Promzona). Hostile tanks fired three times upon the Ukrainian position “Shakhta Butivka” located in the right part of the city,” the spokesperson said. In the area of the Donetsk airport Russia-backed militants made two short-lasting attacks upon Ukrainian positions in Opytne. “One was mortar attack. Another mortar attack took place in Nevelske town in proximity to the airport,” Colonel Motuzyanyk noted. In the area of Horlivka Russia-backed militant groups fired from small arms including sniper rifles targeting Ukrainian positions in Zaitseve, Novhorodske and Verkhnyotoretske. At the Svitlodarsk bulge militant attacks included the use of light weapons and sniper rifles in particular. In the Mariupol sector Russia’s proxies shelled Ukrainian positions near Krasnohorivka with Grad systems. They fired half of the system’s full load – 20 rockets. “Immediately after the attack the adversary brought tanks to the contact line and fired 10 salvos. An hour and a half later adversary restarted attacks and used rocket artillery once again. Starting from 6pm and once in every two hours the enemy was massively firing upon Ukrainian positions. The enemy additionally used tanks during the last two attacks,” said ATO spokesperson. According to Ukraine’s General Staff 28 Grad rockets, over 25 tank gun shells and over 130 mortar mines impacted Ukrainian positions in Krasnohorivka yesterday. Tense situation also stands in the southern part of the Mariupol sector – “along the frontline between Pavlopil and Shyrokyne. Militants fire there both during the day and at night, mostly using light weapons,” Colonel Motuzyanyk noted. The area near Krymske was the hottest spot in the Luhansk sector. Russia-backed militants were firing upon Ukrainian positions there using light weapons. They also fired over 20 mortar mines. The situation in Popasnyasky area became calmer. Lithuania’s Foreign Affairs Minister Linas Linkevičius visited Avdiivka yesterday. “With his own eyes he saw the outcomes of the hostile ‘Russian world’. He was able to see that such geopolitical ideas of Ukraine’s eastern neighbor do not lead to anything else but suffering of locals and damages in the near-front areas,” ATO spokesperson said. Report on the military developments as of February 10 is available here. Interactive data on the shelling: chronology shelling chart and the interactive map.